Kate is a child of the south and apparently that means that grits are a big deal. In fact her mom says that Grits means Girl Raised In The South. When we recently visited Raleigh there was a vegan restaurant with savory grits that were super delicious and reminded Kate of her long lost love of the corny breakfast staple. She came up with this recipe and we have been eating it almost every morning since late December 2014. We like to make 6 servings at a time as the leftovers store nicely. We got this idea from Kate’s mother who told us that Kate’s grandfather used to make up large batches of grits as well. He would pour the leftovers in a bread pan and then put it into the refrigerator. The grits would then setup like a loaf of bread and he would slice off a serving the next morning and heat it up in a pan before devouring it. This makes total sense if you have ever cooked with Polenta. It turns out that Grits and Polenta are pretty much the same thing. 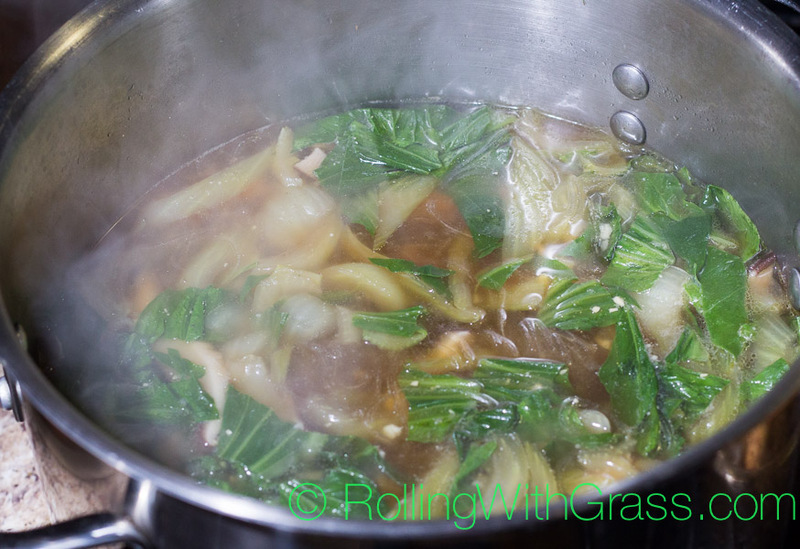 Sauteeing – Add 1/4 cup water to large pot with 1 tsp Broth over medium heat. Add Mushrooms and cook until their juices start to release. Add Onions and Sage. Cook till the Onion is transparent. Add Garlic and Red Pepper and cook till soft. Add frozen Greens and Earth Balance and cook for 2 minutes. Simmering – Turn heat up to High and add 5 1/2 Cups of water, 1 3/4 Cups Grits (if using 5 minute Grits wait for 15 minutes)* and the rest of the Broth powder. Use a whisk when adding the Grits to prevent clumping, no one wants clumpy grits. Once boiling turn heat down till simmering and set a timer for 20 minutes. Continue stirring every 5 minutes. Finishing – Once the timer goes off turn off the heat and add the 1 Cup of Nooch. Stir until everything is happy. Add Salt and Pepper to taste. If you want to be fancy add a quarter of a sliced Avocado and some grilled Tomato slices to each bowl. Enjoy. Storing Leftovers – If you have any leftovers pour them into a container, bread pans work best, and refrigerate. The Grits will firm up and you can eat them cold or heat them up. As vegans, one thing we miss is the artful and tasty delights of sushi as most sushi restaurants tend to have one or two items we can eat. Sure an avocado roll is good, but it would be nice to get something with some texture and umami flavoring to kick things up a notch! The fact that PETA is based out of Norfolk Virginia blows the minds of most people who live in Norfolk. There are not a lot of vegan options in the town that is home to one of the most prominent animal rights groups in the world. Fortunately for us, we have the best friends in the world and, vegan or not, they are looking out for us and recommending places like Kotobuki. They are a sushi bar with an entire vegan sushi menu! WTF? OMG! Our friend Meredith took us here for dinner one night and it was awesome. Vegan salmon and avocado wrapped in soy wrapper; covered with seaweed salad and sesame seeds, 8 pieces. Seaweed salad, inari tofu, fried tofu, and steamed carrots rolled inside, 6 pieces. Hugged roll and peta roll. One cool feature of the restaurant, besides having vegan sushi, is that they have raised the floor around a section of tables. This gives the effect of a traditional Japanese kotatsu table which is low to the floor. Fortunately for us inflexible westerners Kotobuki has simply raised the floor around the table giving you space to put your legs underneath without having to get all origami. Some raise the roof at Kotobuki they raise the floor! Ty-Ku Sake, vodka, pomegranate juice, lemon juice and agave nectar. Ty-Ku Sake, fresh seasonal fruits, and a splash of agave nectar. Ty-Ku Sake, vodka, sliced cucumber. Ty-Ku Sake, orange juice, a splash of champagne. Ty-Ku Sake, vodka, cranberry juice. Lot parking is available in the back, and street parking is available in the surrounding neighborhood.